How To Be The Best Barefooter on Your Lake! 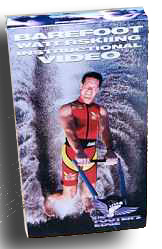 The video is an action packed 110 minutes long–two volumes in one from beginning to advanced. It’s set-up progressively, so you’ll start with the basics and move all the way through the most advanced tricks, slalom, and even jumping! Everything is explained in precise detail while it’s happening-and you’ll watch the action from 5 different camera angles. * Learn to barefoot water ski WITHOUT FALLING! * The easy way to do forwards deep water starts from the boom and from the long line. * A simple 3-step mental checklist for getting every trick started. * What to do during tumble-turns that makes them absolutely effortless and smooth. * How to do front and back one-foots like a pros…without killing yourself trying. * The Lane “Dawg” secret to easy front and back toe-holds. * How to be as solid on the long line as you are on the boom. * Learn to cross the wake and the secret that makes front and back slalom look like a walk in the park. * You will learn the step-by-step way to learn line stepovers. * The biggest mistake most barefooters make with their surface turns–and what to do about it. * How to land your first wake flip and laugh to yourself at how easy it was…because you know the secret. * Learn to FLY! The secrets of the world’s greatest jumpers and how to do it safely. …so you’ll never have to guess or experiment. the best barefooter on your lake! Watch this video from beginning to end and if you don’t agree it’s the best instructional video you’ve ever seen, I’ll give you your money back. No questions asked. It is easy to order…just click bellow and we’ll ship out your video today. It’s only $39.95 plus shipping and handling. You could be watching it in your living room in no time! After clicking the order link below, you will have the option to choose the format you prefer; DVD (Works in ALL regions of the world), VHS, or PAL (for Overseas order only). You will also be given the pricing for the different shipping options before having to enter you credit card info. Attn. Aussies!!! Due to popular demand, we are now able to ship you Lane “Dawg” Bowers’ 2 hour Instructional DVD from SA Australia for only $6 (saves you $19).